It’s been a while since I’ve written any “what I’m reading” posts, so today I wanted to share with you a book I recently read written by one of my blogger “friends” Jenna of the blog Eat, Live, Run. 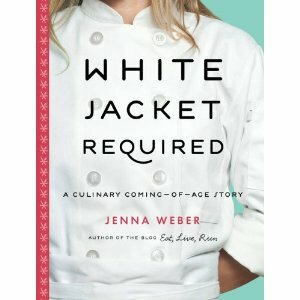 I’ve been following Jenna on her blog for a few years now, so I was excited to get my hands on her first book, White Jacket Required. What I loved most about Jenna’s book is how she intertwined recipes into her chapters, reflecting what she was cooking up during the time or sharing a family favorite meal that her mom would cook for her when she went home (see Julie’s post sharing Jenna’s favorite recipe – Linguine and Clam Sauce – along with a great interview of Jenna!). There are quite a few recipes I’d love to try from the book, including that pasta dish as well as her Shrimp and Grits. Jenna’s Golden Granola recipe caught my eye because she makes it the way I like to make my granola, simply and heavy on the nuts. It’s a straight-forward, no fuss recipe – just like granola should be. I was intrigued by the coconut oil that Jenna used in the recipe, an ingredient that I’ve been trying to cook with more often these days. I whipped up a batch of this granola in under 30 minutes and served it up exactly as Jenna suggested – with creamy thick Greek yogurt and chopped bananas. Granola is so adaptable; I easily substituted chopped walnuts since I didn’t have any hazelnuts like the recipe calls for. I also scaled back about a 1/4 cup of honey since I prefer my granola a little less sweet. I love having homemade granola in the house, it’s really such a treat. Though, kind of dangerous – I can’t keep my hands off of it! This granola recipe is perfect for anyone who wants to make granola but has never tried to before. Once you make homemade granola, I promise you’ll never buy it again. Preheat the oven to 325°F and grease a large baking sheet. In a small saucepan, combine the maple syrup (or honey) and coconut oil and bring to a simmer over low heat. Simmer for about 4 minutes, stirring constantly (do not splash). Remove the pan from the heat, stir in the vanilla extract, and set aside. In a big bowl, stir together the oats, hazelnuts, sunflower seeds, almonds, cinnamon, and sea salt. Drizzle with the hot syrup and stir well to coat. 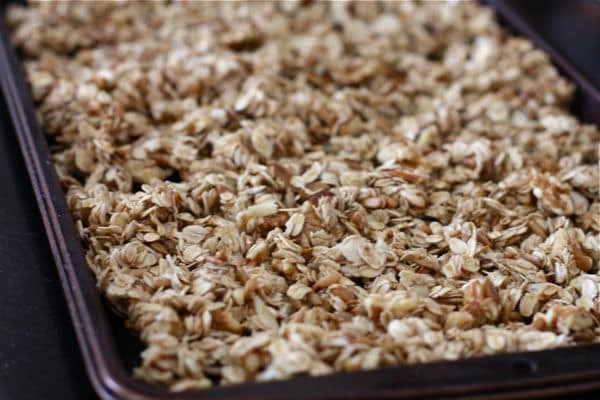 Spread granola mixture evenly on prepared baking sheet and bake, stirring frequently, until the granola has turned a golden color, about 20 minutes. Remove from the oven and let cool. 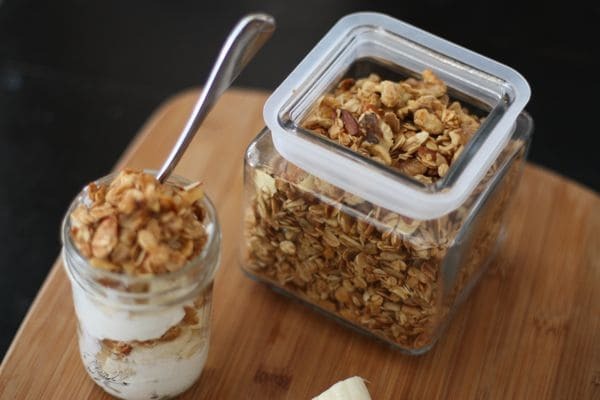 Store the granola in sealed plastic containers in the refrigerator for up to 3 weeks. Note from Jenna: I like to use lots of nuts in this, but feel free to substitute whatever you like for your own variation. This granola will keep for about three weeks in a sealed plastic container in the fridge, making it a quick and easy breakfast when topped with thick yogurt and banana slices. Beautiful! I love how simple the flavors are. I am a fool for classic granola!! I’ve always had a secret dream to attend culinary school, too. I also like my granola full of nuts and less sweet. How was the coconut oil?? PS: I also can’t be trusted with homemade granola in the house. Oh my gosh I just finished reading this book and made that granola too! Maybe I should make something else for when I post the review on Friday so people can see other recipes from it. I love this. Our family loves homemade granola! I was thinking about making and sending to my sons in college. 🙂 Love Jenna’s book, too! I adore the book! Such a great read. She is just so down to earth. I will have to try this recipe. I just made the lemon brown sugar chicken- SO good! Hey Aggie! I love Jenna’s blog as well. Can’t wait to try the granola recipe…love homemade granola! Thanks for sharing! I have been looking for a granola recipe using less sugar … this is perfect. Thank you so much for sharing! I love granola and I’ve never made it, I’m sure it’s like everything else and so much better homemade. This just looks great. I need to read Jenna’s book too! Thanks Aggie for sharing this granola recipe. My girls and I love granola over vanilla yogurt, but I have never tried do it. This time I’ll try it and will let you know how it turns out. 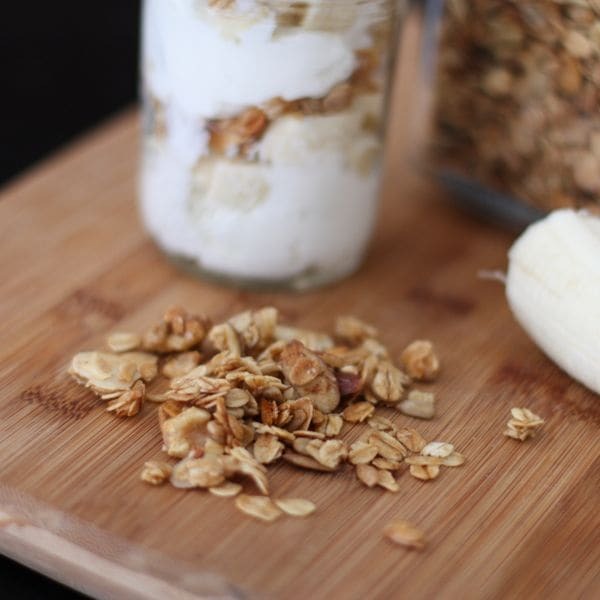 We love granola and this recipe looks so delicious! Love theses flavors! I could honestly put granola on top of EVERYTHING!! Thank you SO much, Aggie!! I am so glad you liked both the book and granola — you’re so sweet. Hopefully we’ll get to actually meet in real life one of these days so I can give you a big hug! This sounds awesome. I find myself making a batch of granola every other week! This look so good and healthy! 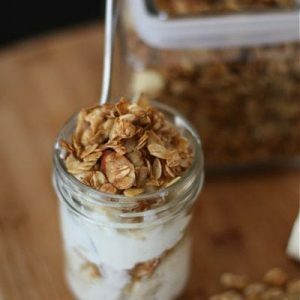 I always add granola to my yogurt, but I haven’t tried making homemade granola yet. I need to add this to my 31 Days of Homemade list! I can see this being great to have on hand for quick snacking! I love Jenna’s book! 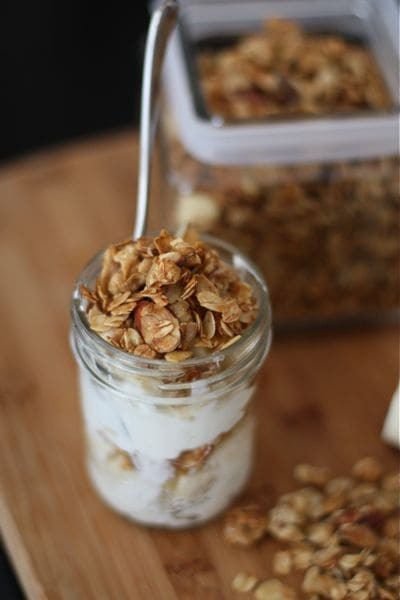 I have to try this granola recipe soon!! I love your pictures, Aggie!! I have thought a little bit about going to culinary school myself, but then I remember all the student loans I’m paying off from my first two degrees and quickly change my mind! But I’m definitely going to pick up this book and live vicariously through Jenna’s experience. 🙂 Love this granola recipe–it would be so perfect on a baked apple too! I have Jenna’s book, but haven’t read it yet – am def looking forward to the read. I have become addicted to homemade granola over the past year and love to use coconut oil. And I go heavy on the nuts, too. Looks like I have another recipe to try, thanks! So, I’ve got this in the oven now, looking forward to tasting it! This will be my second attempt at granola making. 1st recipe I tried was okay, but not what I’d hoped. I think this wil be much better! What is the purpose of simmering the honey/syrup and oil? Is it just for melting? Could you heat in the microwave instead? Just curious. Trying to save time and dishes…. Btw, tried this with a mix if 1/2 honey and 1/2 maple syrup…. Btw, found this via Pintrest! Hi there! If you simmer the oil/syrup it gets it very thin and easier to spread around. I don’t always do it that way though, usually when I’m using coconut oil (since it’s in solid form), so it’s up to you…but it’ll distribute better warmed up (from experience). I’ve stored it in tupperware, mason jars and even zip locks, in the pantry or on the counter! Let me know how it turns out!! I hope you enjoy it! 🙂 Thanks for stopping by! It turned out great! Super crunchy,which is what I was going for. Hubby liked it too! I did have to bake it a few extra minutes, but that could just be my oven. I used half syrup and half honey which gave a really nice flavor. Also baked on parchment paper to help keep it from sticking to my pan. This is definitely going on my keeper list! I love the sound of honey in it! Yea, I have to keep an eye on granola any time I cook it…I have burned way too many batches! So glad you enjoyed it! Good read. It seems a healthy solution for quick breakfast meals. Thanks for the post.